Rational Whimsy | Astro Questions: How Much Energy is Needed to Leave the Galaxy? Astro Questions: How Much Energy is Needed to Leave the Galaxy? You can find parts 1 and 2 here and here (respectively) dealing with some of the difficulties of traveling at light speed, and then actually traversing the galaxy given its magnificent size. Let’s now think and talk about just how much energy we’d actually need. 3. Blah blah, what’s all this about infinite energy? How much energy would we actually need? I’ve clearly overlooked the need for energy thus far because it’s just damn troublesome. However, if you’re still reading, you might actually be interested in what that energy budget looks like. So let’s jump into this, with the knowledge that the short answer is a lot. For this calculation, we need a mass. I’ll use myself as an example, as I (in my grand bias) feel that I’m about average height and weight for a healthy adult male. Last I checked, I’m 180 lbs—so 81.8 kg. I’m going to accelerate myself to 40% light speed with an acceleration of 3g, then continue on at that speed forever. I’m choosing this speed because a) it’s damn fast, and b) it’s at about the threshold where relativity starts to really matter (the Lorentz factor is what you have to multiply your mass by given some speed). The interesting thing here is that once I’ve accelerated up to the speed I want and I’ve left the Sun’s gravity (and am far from other sources of gravity), I really don’t need to expend much more energy. You can thank the law of inertia for that, as objects in motion stay in motion unless acted on by something else. So the majority of my energy budget is spent in that first period of acceleration. I calculate this by figuring out how much work my massless spaceship (basically no spaceship) needs to do (not accounting for relativity). The energy required for moving my mass alone up to 40% light speed is about 590 quadrillion Joules, which means nothing to you so let’s make it more relatable. That amount of energy is about the same amount consumed by the entire state of North Dakota in 2012. But hey, like no one lives in North Dakota. And, that’s JUST my mass—I’d need to be in a shuttle. 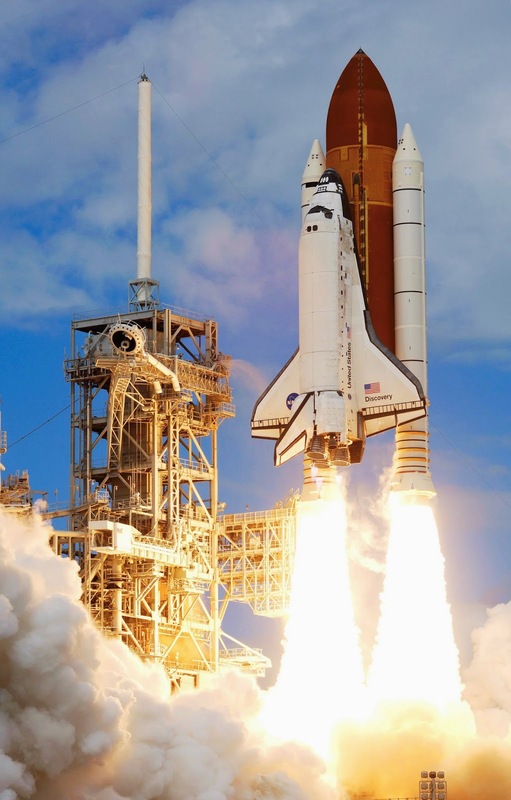 The now-retired space shuttle weighs about 2,030 tons, most of which is the weight of the fuel. I’m not going to bother adding my mass to that. That’s just stupid, like considering the effect of the weight of an individual grain of dust on your own weight. Anyway, the shuttle (including the thrusters) weighs that much and only accelerates for about 600 seconds (or 10 minutes). Let’s do the entirely wrong thing and directly scale up the weight of the shuttle by the time needed to go through the whole acceleration period we calculated earlier: 47 days or 4.06 million seconds. That’s a factor of about 6,800! So you’d probably have to increase the mass of your shuttle to a number around 12.5 billion kg!!! Note that this is not at all the definitive answer of how heavy the new shuttle would be, just a poor ballpark figure. There’s a host of other things to keep in mind here. For example, with every pound of fuel you add into your shuttle to push it some extra distance, you have to also include enough fuel to push that extra pound. You have to also include more metal to make a bigger fuel tank, and then include enough fuel to account for that extra metal. You have to also consider that we eventually drop fuel tanks once they’ve been exhausted, and that we always include a bit more fuel than is actually needed. As you can see, it’s a little more complicated than simply scaling things. However, I don’t want to do all that so I’m just going with the naïve base answer, and am leaving it as an exercise for the reader to figure out how to do it more precisely. Ignoring the fact that that new weight is entirely impractical and wrong, the energy needed to get that shuttle mass up to 40% light speed over 47 days is now not 590 quadrillion Joules, but about 90 trillion trillion Joules (we’re talking nonsense numbers here). In 2008, the entire world consumed not even a fraction of a fraction of that. In fact, you’d have to take that rate of worldwide consumption and extend it over about 174,000 years in order to equal the amount of energy it’d take to get that shuttle up to 40% light speed, and we’re not even including relativity! Basically it’d take more energy than humanity’s ever consumed! What’s the next thing that can compare to the energy needed? All of the output of THE GODDAMN SUN in every direction for ONE SECOND, which is more than 4 times our energy budget. Did you hear that? That was the sound of your mind being blown.